Christmas time, chocolate time. That seems a pretty universal law1 although it comes in different styles and shapes. Today for instance, 6 of December, many Germans will get their chocolate ‘Nikolaus‘, but chocolate Santa-Claus-like treats are fairly common in many places. It relates to a lot of great childhood memories, probably not only for me. However, when I had a closer look at my ‘Nikolaus‘ today, it felt devastating. These guys are clearly made of bad bad crap chocolate! I am not sure if it is particular to the German chocolate market. But it turns out that 8 out of 10 Germans will answer to the question of “who makes very good chocolate?” with “Lindt”, referring to the Swiss company “Lindt & Sprüngli”. Somehow this brand succeeded in creating an image of being a premium chocolate manufacturer. Just looking at their chocolate composition today, however, tells a very different story. This is cheapest possible chocolate. No serious chocolatier would ever dare to work with a chocolate of such low quality! I am not kidding here (sorry Lindt believers). When being trained to work as a chocolatier, one of the first things you learn is that real bad chocolate can already be distinguished from (most likely) acceptable chocolate by a brief look at the list of ingredients. If chocolate contains artificial vanilla aroma (“Vanillin”): bad. Not because Vanillin itself is something very bad, but it directly shows that the manufacturer not even considers the chocolate worth using real vanilla. If chocolate is made with a very high sugar percentage (the Lindt milk chocolate Nikolaus guys contain 55% sugar): bad. Again, sugar is fine. But it is one of the cheapest ingredients on the list, so many bulk manufactures increase the sugar percentage to save money. Sugar also makes chocolate predominantly ‘sweet’ so that it can easily mask a low quality cocoa flavor. If chocolate contains fat other than cocoa butter: very bad. In the EU it is allowed to add up to 5% of fat other than cocoa butter and still call the final product chocolate. However, that is clearly considered a very bad sign and usually only found in low price, low quality chocolates. To put this in perspective: In the US you wouldn’t be allowed to even call it ‘chocolate’. Guess what, the Lindt Nikolaus guys violate all three rules! They contain 55% sugar, they use artificial vanilla flavor, and they have butter fat added. If you still haven’t bought some… please leave them on the shelf and better buy some real good chocolate. You might not find it in your supermarket, but I guarantee that it’s worth the little extra effort. 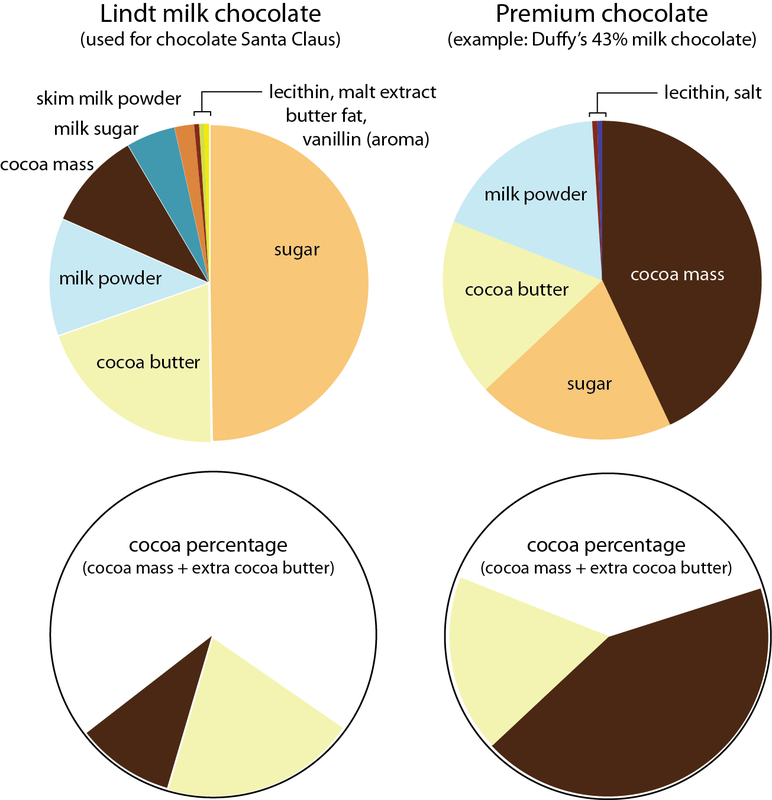 Lindt versus real premium milk chocolate ingredient comparison (here as an example for a premium milk chocolate: Duffy’s 43% milk (Ecuador). It is also intressting to note that official rules will allow to count both cocoa mass and cocoa butter to calculate the ‘cocoa percentage’. More and more premium manufacturers, however, stoped including the cocoa butter as this is often considered to be close to cheating. When excluding the extra cocoa butter added, the Lindt guys would have somthing around 10% cocoa… not much, right? You’re right, most Germans think Lindt is top drawer. I think that’s because truly good chocolates like bean to bar chocolates are hardly available. Germans want everything to be cheap. That said, I am a frequent regular at the local Lindt café for their iced dark chocolate drink & their coconut + dark chocolate ice cream. I haven’t had actual Lindt chocolate in some time but I used to find it pleasant enough. Not as prime chocolate, but as an enjoyable snack. A friend recently told me she thinks Lindt have dropped in quality. Have you noticed that as well? BTW, thanks for following my Twitter. I’ve been following you for some time too. As a fellow scientist I of course endorse a nerdist approach. First, thanks for the comment. I agree with you that good bean-to-bar chocolate is still mostly abscent from the German market with few notable exceptions (such as the fairly popular austrian brand ‘Zotter’). And yes, you’re also totally right here I think: the German food market is still (just as the Dutch market) mostly price and not quality driven. Hi, thanks for your reply! I only saw it today because there is no setting to get comment alerts. Hope you had a wonderful Christmas with lots of high quality sweets! Wow, thanks for pointing Zotter out to me. I’ve had something from them before – maybe hot chocolate? & some small, more gimmicky things but definitely nothing bean to bar. I’m either going to place an online order or wait till I go to Germany in Feb. On a general note, I think Zotter have become popular in Germany not for their bean to bar approach but for their “pretty” stuff & cool packaging but I might be wrong? My parents sent us some small Lindt Santas for Christmas. I don’t think the taste of those has changed. Sure you can tell it’s not a high quality milk chocolate but still, there’s something about it that I like. It doesn’t taste like milk chocolate though. BTW, if it isn’t too much to ask maybe you’d care to reply/direct further communication to my email? Otherwise it’s going to be pretty hit & miss. You can reach me at wattwurmnashi [at] gmail [dot] com or look for wattwurm nashi [profile] or wattwurmnashi [page] on Facebook.